I can hardly believe summer is ALMOST over. I have tried to cherish every last warm summer night. I wore this outfit over the weekend for a double date with Laura and her boyfriend. We bonded over our love of wine & statement necklaces and dominated the boys in a game of scrabble. I wore my Swell Caroline necklace and love the transformative powers it has on a casual summery outfit. 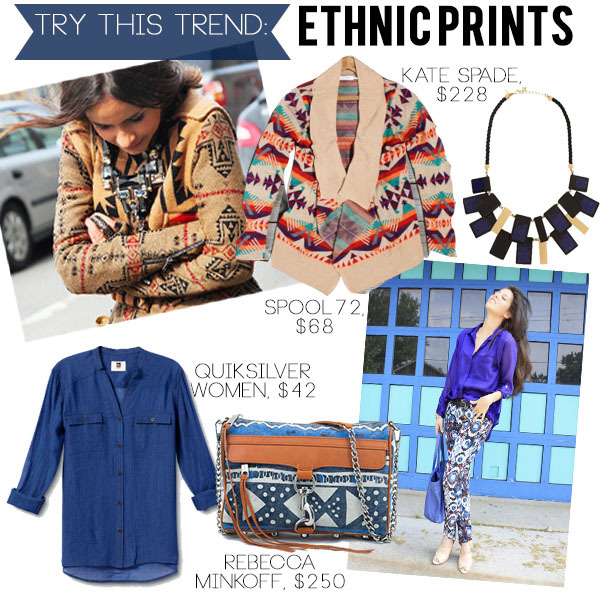 It's funny, tribal print is one of those trends I just don't see disappearing anytime soon. Whether it's more ethnic inspired or geometric, there are so many updates in different colors & patterns to keep it looking fresh. These are some of the fall tribal prints I'm loving right now-- printed pants, "navajo" sweaters, & bold bags and statement necklaces. I went on a bit of a fall shopping spree last weekend and it's making the idea of slipping into layers and drinking hot apple cider a tad bit more bearable... as does football season, but that's another post! Love the tribal printed crop top! I've been wanting to a similiar crop top but not sure I can pull off the look. You look fabulous though! I can't believe summer is nearly over too! I love the necklace. It's an amazing statement piece! Can you come down to FL and go shopping with me and make me outfits like this?! I miss my personal stylist! You look adorable Lauren! I can't believe summer is almost gone either! Trying to soak up every last minute! I believfe tribal/ ethnic prints never really go out of style...they've always been a favorite of mine from season to season. I just love how you take the print from edgy to sweet with the skirt and necklace! It's so cute! ♥ ♥ ♥ You are incredibly beautiful, cute T-shirt - I like the design! very nicely in this set you :) you have a beautiful smile, and jewelry! what a great necklace - i can see how it goes with so many things! I love all your outfit post! Pretty good post. I just stumbled upon your blog and wanted to say that I have really eyed reading your blog posts. I love everything in her specially he hair, day dresses etc… I think you look great! Love the crop top and your necklace is fantastic! … I will be back again. Love that sweater so much I just ordered it! Great find!! !